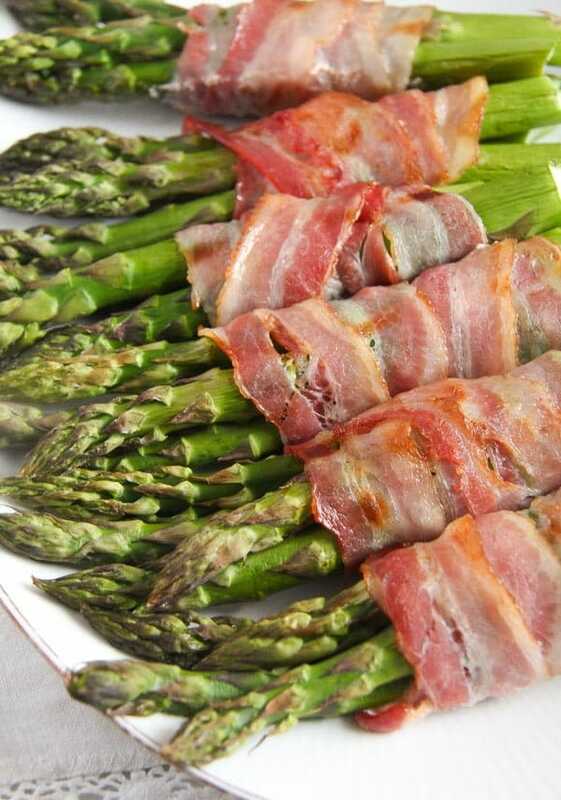 Asparagus bundles wrapped in bacon and baked in the oven, a quick and delightful asparagus dish. Only two main ingredients, some good olive oil and some freshly ground black pepper, 10 minutes of your time and about 12 minutes cooking time. That’s it! Yet the result is a most satisfying and delicious asparagus dish, suitable as an appetizer, light dinner or side dish. I try to make the most of the asparagus season every year. I do have my classics, for instance this light Asparagus Chicken Noodles Soup or the Sauteed Asparagus with Garlic, but every year I try new ways of cooking asparagus as well. 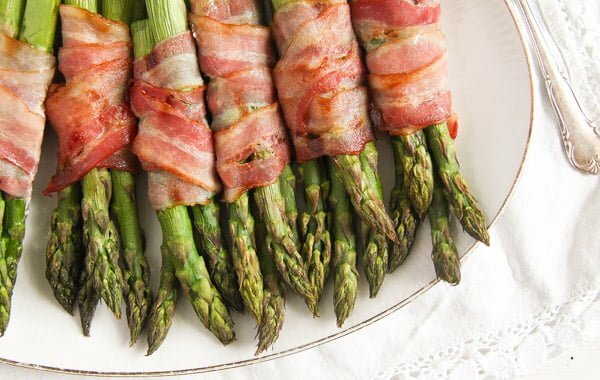 New this spring were the Asparagus Salad with Hard-Boiled Eggs and Ham and this amazing Bacon Wrapped Asparagus – Oven Baked Asparagus Recipe. 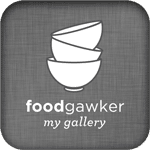 I have actually seen this recipe before, but I was never much attracted to it, because I had in mind some pretty bah ham and white asparagus bundles that are served by party caterers here in Germany. No matter what wedding/ christening/ birthday party you attend (a larger event), you can be sure to find those ham and asparagus bundles on the buffet. 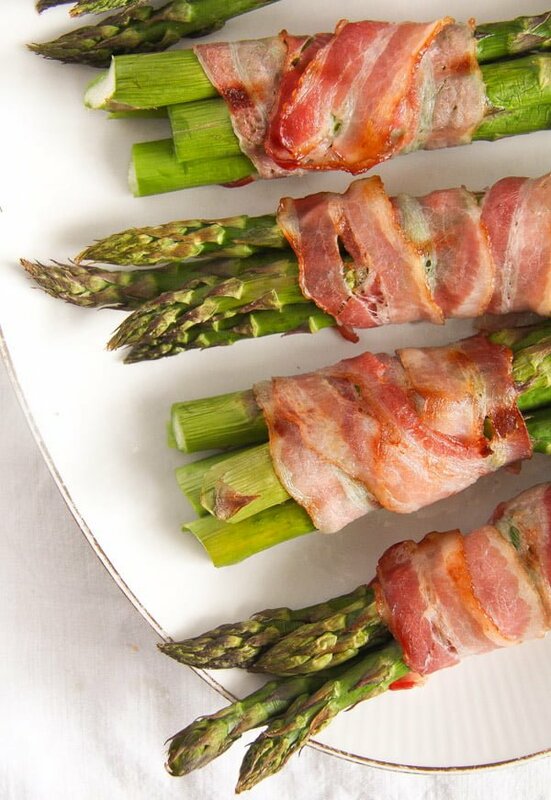 I’ve tried them once and trust me, I will never try them again… Soggy, canned white asparagus, wrapped in pale, cheap, pressed ham, it is the very last thing you want to eat… So, when seeing these Bacon Wrapped Asparagus bundles I imagined them to be something similar. But how wrong I was!! These bundles have absolutely nothing in common with those party bundles. 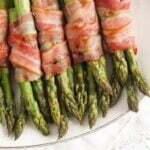 The asparagus remains firm and crunchy and the bacon renders it unbelievable flavor, a real delight! Prepare the asparagus by removing its lower tougher ends. Don’t throw those ends away though, you can use them to make a wonderful and delicate asparagus stock, which can be used for soups, vegetable stews or risotto. For more information on how to make asparagus stock, have a look at this post Asparagus Soup – Creamy and Aromatic. This Bacon Wrapped Asparagus – Oven Baked Asparagus Recipe only needs a very short time in the oven. 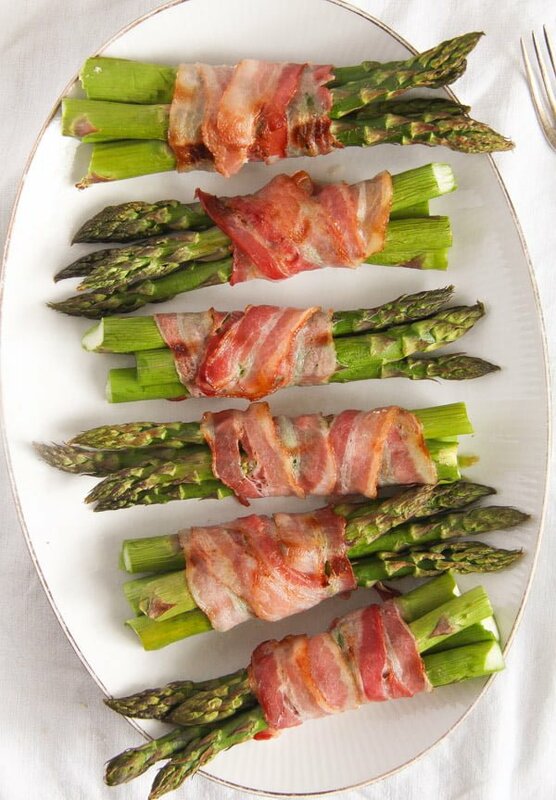 Make sure you preheat the oven and only bake the bacon asparagus bundles for about 12-14 minutes. My asparagus spears were on the thicker side and needed about 14 minutes, if your asparagus is thinner, check after 10 or 11 minutes already, the asparagus should definitely still have a bite. I bought two bundles of green asparagus for this recipe, each weighing about 450 g/ 1 lb. 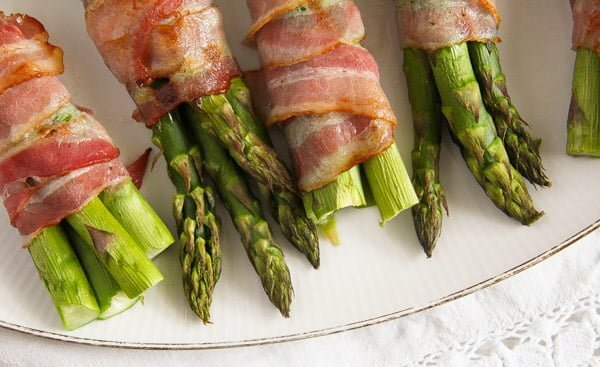 The asparagus spears were a little thicker than usual, so I preferred to wrap only 4 spears into each bacon wrapped bundle. However, if your green asparagus spears are thin, as they often are, feel free to wrap some more of them into each bundle. The bacon we usually get in Germany is cut into extremely thin and rather narrow slices. I had two packets of it, each containing 8 slices of ham. I needed two (sometimes three) thin bacon slices for each asparagus bundle. I remember the bacon I used to buy when living in the UK, it was definitely thicker and double as wide as the German bacon, in this case, one slice of bacon per asparagus bundle should be enough. Otherwise, you will only need a little bit of olive oil, not too much, about 2-3 teaspoons, only enough to very lightly coat the asparagus spears with it. And some black pepper. I didn’t find it necessary to add any salt, I think the bacon was salty enough and gave the asparagus exactly the right amount of saltiness it needed. We had these Bacon Wrapped Asparagus – Oven Baked Asparagus Recipe with polenta and cheese. A rather unorthodox combination, but so goood! 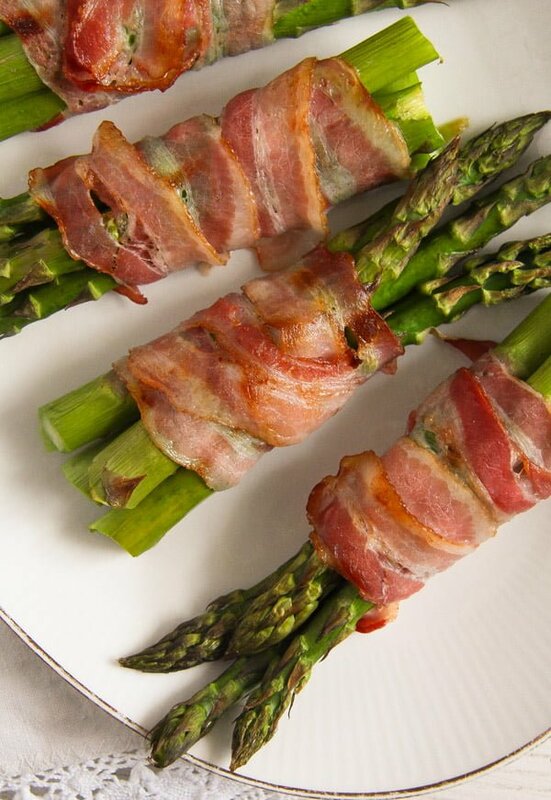 You see, I knew that the kids would not want to eat the asparagus, not even if it’s wrapped in bacon (bacon they love…), so I wanted to make something that they would eat. And they always eat polenta and cheese. You might not otherwise think of eating asparagus with polenta, but if you like polenta, than I can totally recommend this combination, my husband and I absolutely loved it. Otherwise, you can serve the bacon wrapped asparagus with boiled or roasted potatoes or with crispy white bread and a salad. A perfectly simple and delicious meal! Preheat the oven to 200 degrees Celsius/ 400 degrees Fahrenheit. Line a baking tray with baking paper. Clean the asparagus. Dry the spears and remove the tougher woody ends (use them to make asparagus stock). Lightly coat the asparagus spears with olive oil. 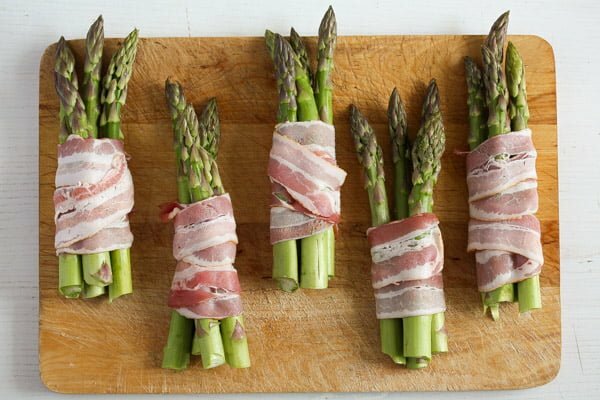 Form the bundles by wrapping about 4-6 asparagus spears (depending on their thickness) in one or two bacon slices (depending on their size as well). Place the asparagus bundles on the prepared baking tray and sprinkle with some freshly ground black pepper. Place in the hot oven and bake for about 12 minutes. If the asparagus spears are very thin, start checking after 10 minutes or so, if the asparagus spears are thicker, they might need about one or two extra minutes. Check by piercing with a fork, they should be softer, but still have a bite. Serve immediately. German bacon is very thin and narrow, so I used 2 slices for each bundle. If your bacon is wider, one slice should be enough. These are so pretty, perfect to serve when entertaining. I haven’t done this in years and it makes such a great dish! Thanks for the reminder and inspiration! I like some canned vegetables but asparagus is not on the list (I tried them only once and they were mushy). These bundles on the other hand, are perfectly cooked. I can make a whole meal of them, but pairing them with polenta and cheese sound so good!! Not only these are delicious, they look so cute wrapped in bacon too. My kids love anything wrapped in bacon 🙂 but again, who doesn’t!